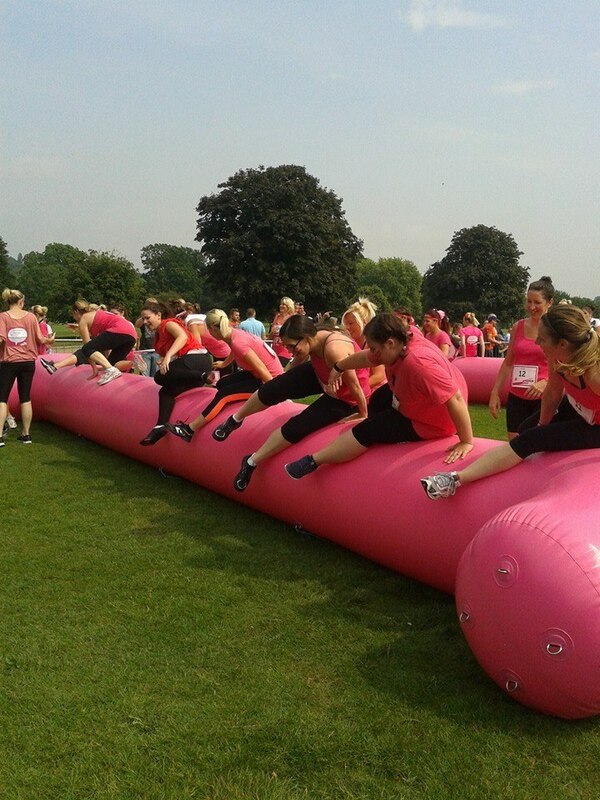 Not traditional hurdles, huge inflated pink rolls which we had to clamber over! This was exactly what it sounds like, some tyres laid on the floor, which you have to run through. like you would imagine for army training. except the tyres had been painted pink. Finally, some mud! We had to climb over a hurdle, (not inflated this time – just some scaffolding covered in fabric signs!) and land in a paddling pool full of muddy water! Rope strung across at different heights and angles, so that you have to work your way through it by going under and over. Felt kind of like a spy avoiding laserbeams. Except I could touch them and move them out of the way. This old classic. Cargo net up one side, go over the top, and corgo net down the other side. These things always mess with my head a bit, and I end up feeling very unsteady on the top. we were stuck queing for this one for a bit as a poor lady was quite distressed with trying to get over it. she did it eventually, and we all cheered and clapped. 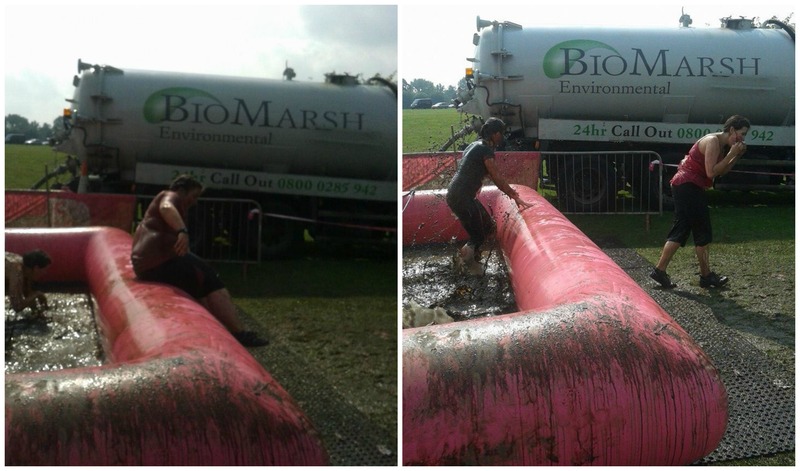 Obstacle 8: Mud. Just Mud. 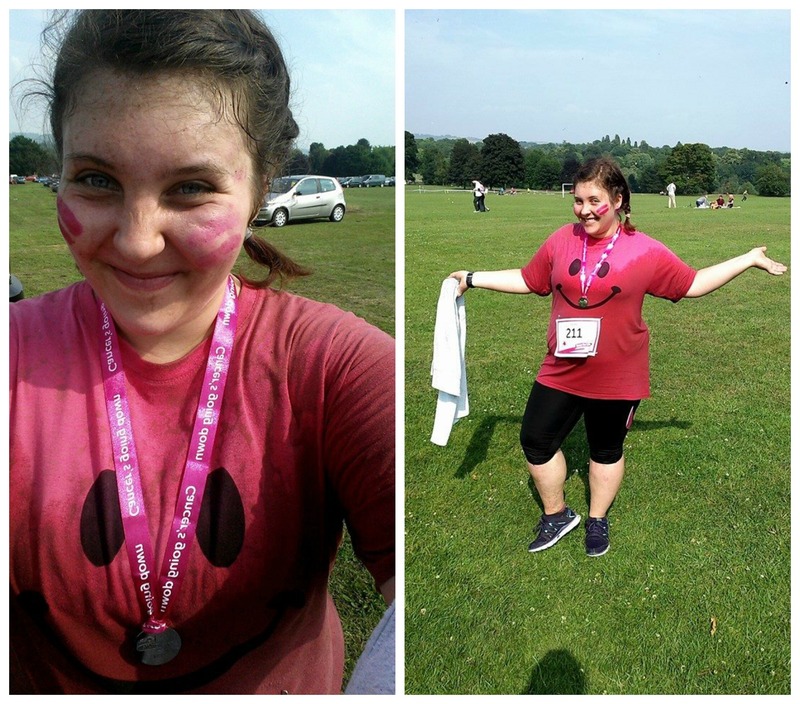 Then we had a short sprint to the finish! My JustGiving page is still open, so If you do get the chance, please do try to give a little something towards the fight against cancer. There are some more pics floating around on other devices – I’ll post any good ones!